Not everything is a short message tho’. I mean, lots of stuff is, but not all of it. Some things can be short. But… sometimes you need to share an idea that requires a bit of explaining, or warrants an extended conversation. Until now, Slack has always had a ‘Posts’ feature for this purpose (‘Snippets’ covers a similar function, but for sharing portions of code or other blocks of pre-formatted text). The problem was… it got about 5 hours of love early in the product development process and was never touched again: a poor, unloved feature. 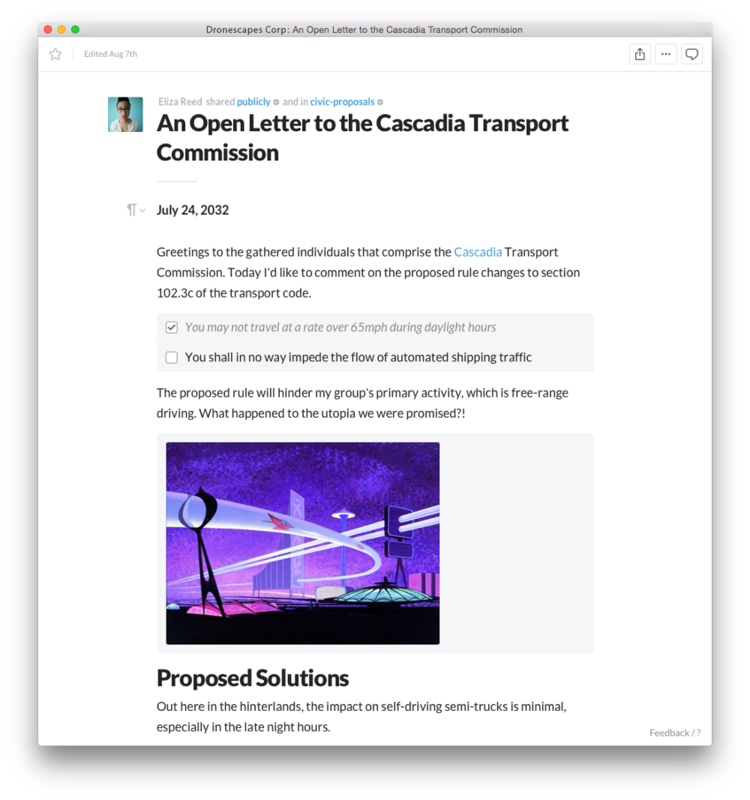 Today we’re releasing a much better version of Posts which we’re calling Posts 2.0. Included in this ground-up rewrite is a slew of improvements to make it easier to create, share, and discuss Posts with your team as well as improve the tools within it. First up, creating Posts is easier in the latest version of the desktop Slack app. New Posts launch in the app itself instead of sending you to a web browser and writing is done via inline editor. Text tools now include header formatting, tools for making lists, and tools for making checklists as well as sharing small bits of code. Posts will auto-expand tweets and show previews of web site URLs optionally. If you paste a link to an image from the web, the image will appear in your post (and you can delete the original reference if you prefer to keep things tidy). As before, if you star a post within the editor it will add to your Starred Items list. Sharing your post is as easy as picking a channel, team member, or yourself (@slackbot) where you’d like your Post to appear. Additionally, any Posts you write will be available in the Your Files menu option in the Slack app itself. Posts retain the feature of being a standalone comment thread in channels where they are posted, so discussions about them stay organized. Text formatting in Posts follows the markdown-style shortcuts from Slack’s own messages as well as adding a few others. 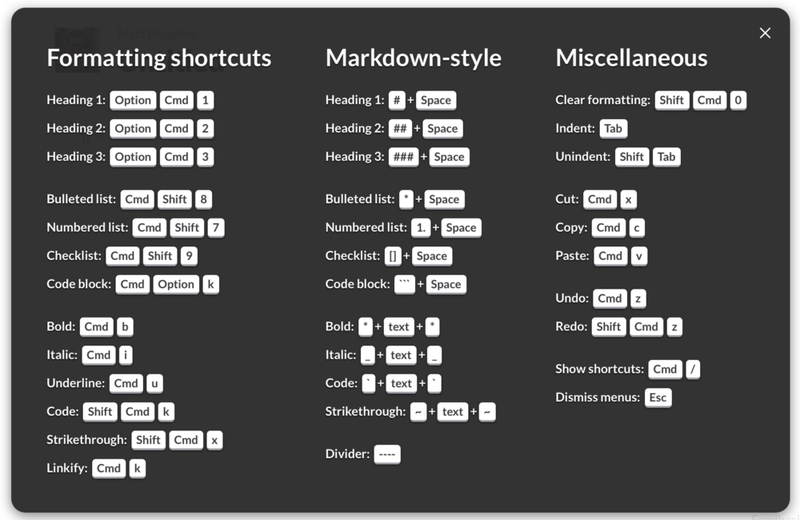 There are plenty of keystrokes to make formatting easy, found via a dropdown. Slack messages are great for conversation, but if you have a big idea to share with your team, try the new Posts to lay out paragraph after glorious paragraph explaining it all. Need to track a punch-list of tasks before a big feature rollout at work? Try the checklists feature in Posts shared in a channel where everyone is pitching in. Sketch out new feature ideas with inline code snippets and display mockups in the page that everyone in the company can see and comment on, all in Posts. *Satisfaction not guaranteed. The posts work great, but we can’t do anything about the quality of big ideas.